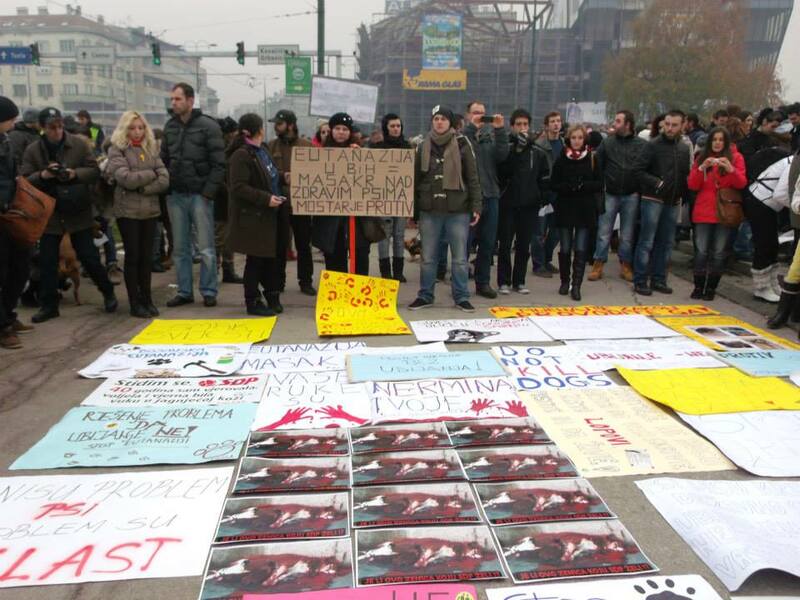 The Association of Animal Welfare Organizations and many activists (and their dogs!) 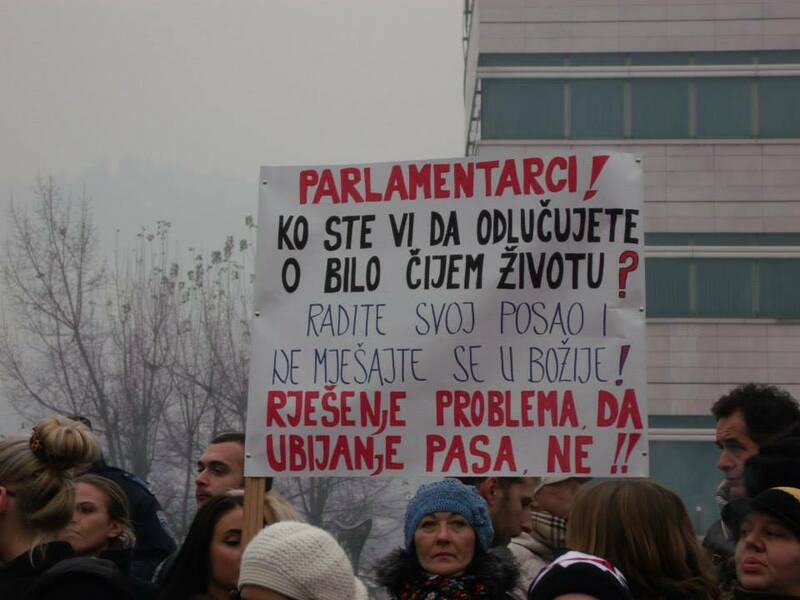 from all over Bosnia Herzegovina organised protests today, Sunday, 15th December, in front of the building of Parliamentary Assembly of Bosnia & Herzegovina. 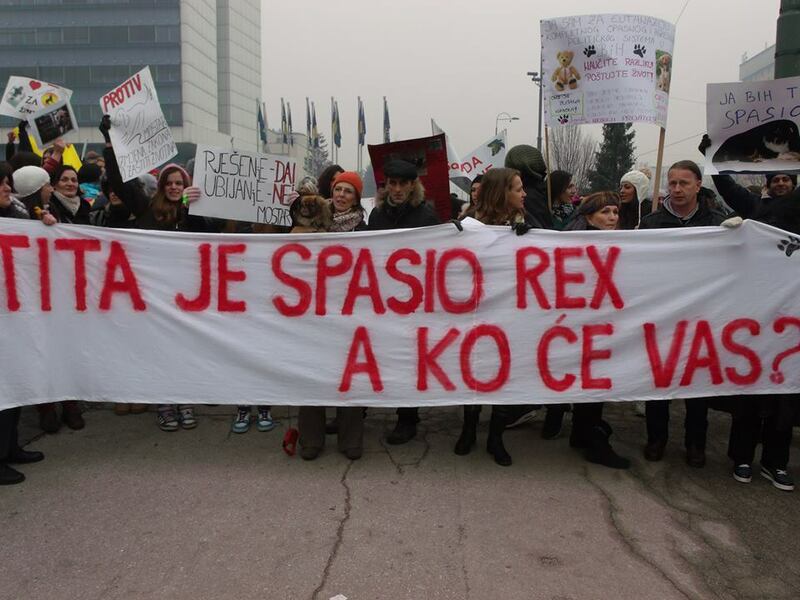 Some activists from Serbia and Croatia also joined the protest. 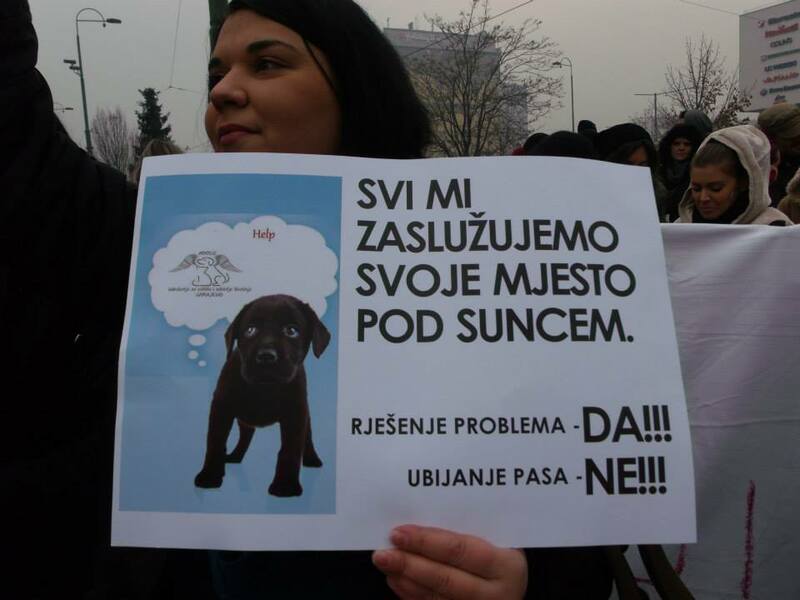 Several hundred citizens of the protests said: Stop euthanasia of dogs! 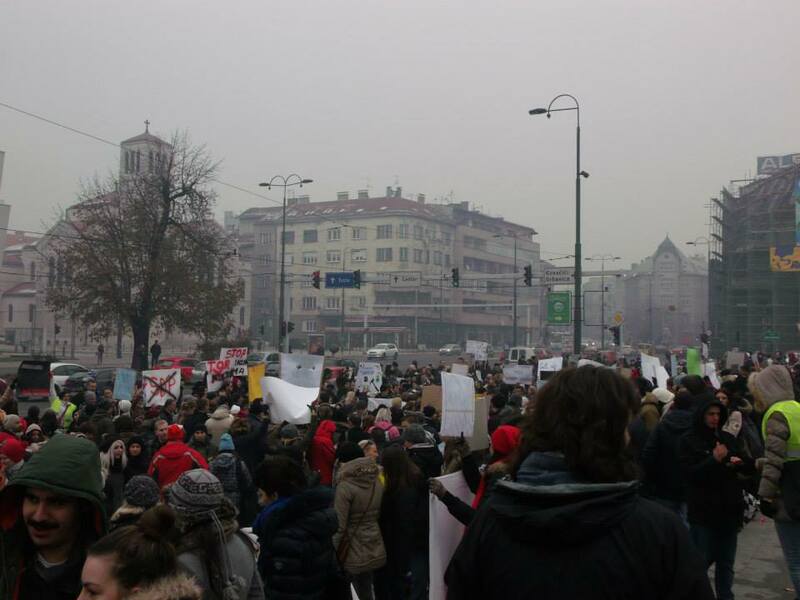 I know it seems like not much has been ‘happening’ regarding the amendments — but the activists in BiH have been working very hard to do everything they can, with media reports, TV interviews/forums etc and the protest march today. 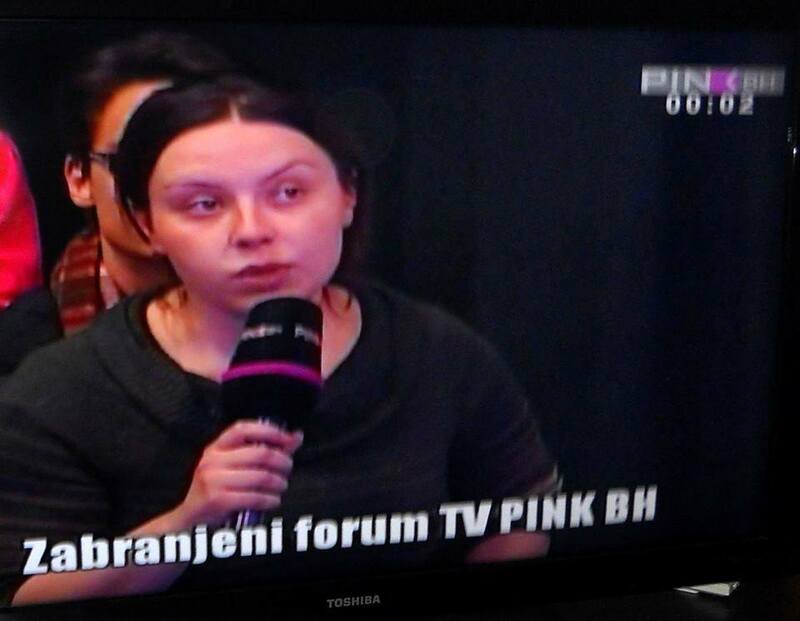 For example a few days ago there was a TV forum on PINK TV all about the amendments and why the existing law was not implemented – all guests were activists or veterinarians. 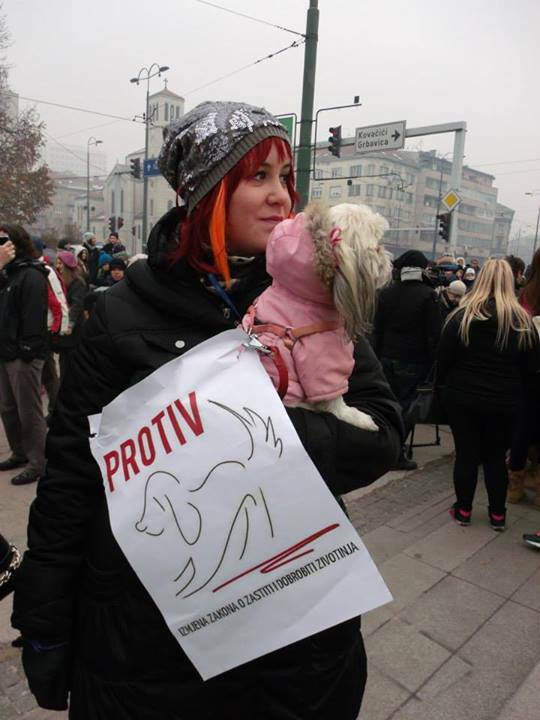 State veterinary inspector Inga Dujmovic was there, Snezana Vidovic an actress from Zenica, the leader of SAPA Animal welfare organisation, Aida Cizmic from Prijatelji Mostar association was a guest as well, and activist Jelena Paunović attended. Representatives of the pro-kill law group UGRIZ (Stop bite – Stop ugrizu – http://ugriz.com/ and on FB https://www.facebook.com/groups/stopugrizu/) and the MP Nermina Zaimovic Uzunovic (original proposer of the amendments ) did not want to come to the debate because they claimed that the TV station has had biased approach in favor of activists from the very start that the show was ordered and paid for by activists. Also, Dalida Kozlic, lawyer and activist, was a guest in a TV show, “Answer to people” – a live TV show on Federation of BiH TV. 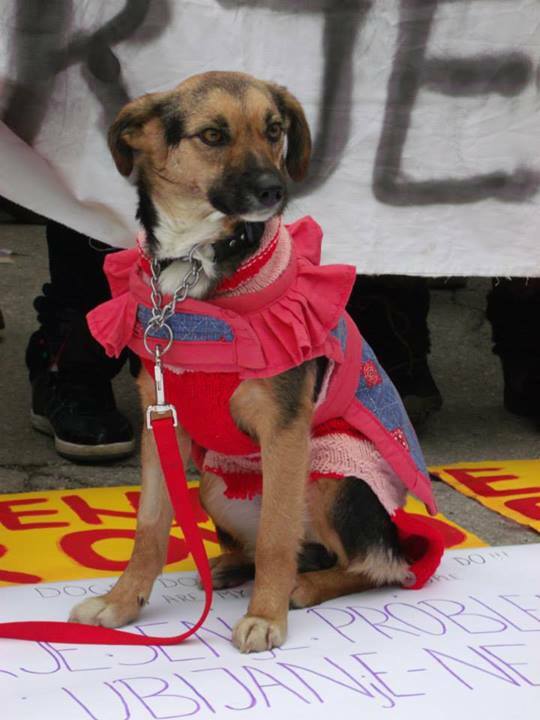 Other guests were MP Nermina Zaimovic Uzunovic, Adnan Omerdic (from Stop bite – Stop ugrizu), Nihad Fejzic (dean of Veterinary faculty in Sarajevo), Semir Efendic (a mayor of Novi Grad where illegal hygienic service kills stray dogs) and Slavo Jovicic (SNSD) who is against the amendments. We hope to have a copy of this with translated subtitles soon. What we can do, once again, is to continue to help with financial support. The activists need our support with donations to help them continue to campaign. Even if the law goes through, there is much they can do: all shelters need to be closely monitored to try to ensure that any ‘euthanisation’ as required by these proposed amendments is humane and that all other aspects of the Animal Welfare Law are implemented. Any amount will help, no matter how small. You can donate as per the instructions below via Paypal to donations@awabosnia.org (mark for ‘advocacy’) or there is a YouCaring fundraiser especially for this: https://www.youcaring.com/kill-law. 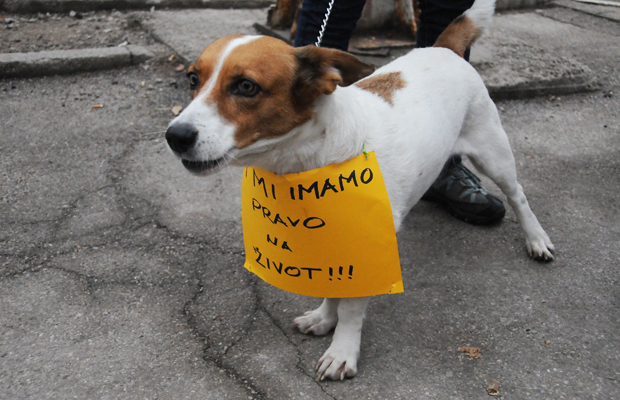 Activists in BiH are doing their best to campaign against these amendments and to educate everyone in their country to the truth of what is happening. 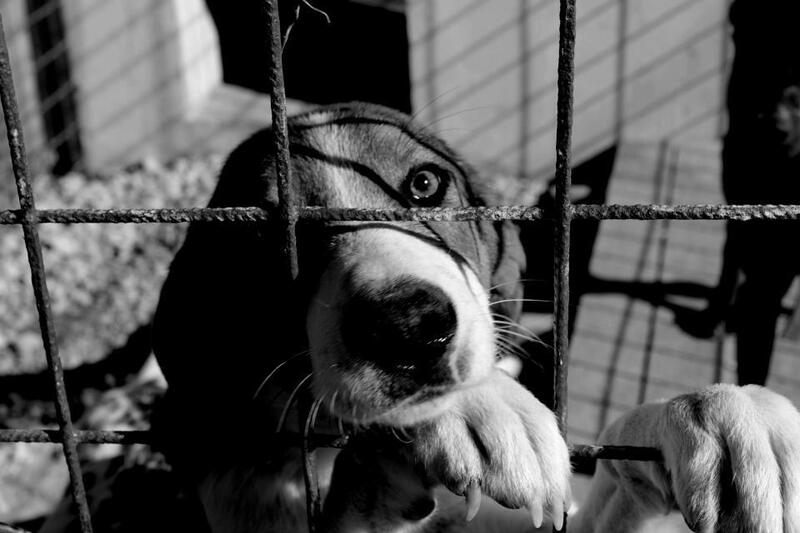 Please sign and share the petitions! 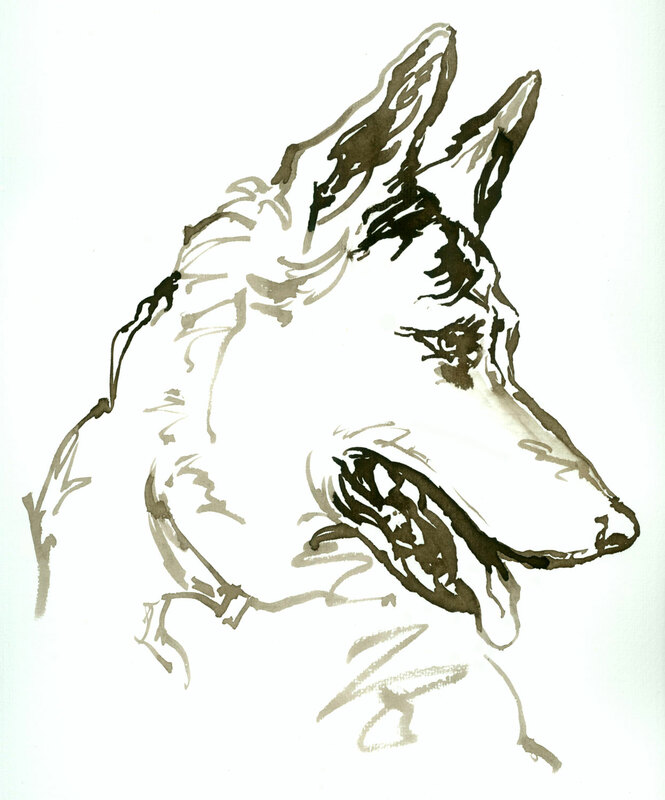 This entry was posted in Advocacy, Fundraising, News Articles and tagged protest march by Sandra Jensen. Bookmark the permalink. It is heartearming to see the people uniting to halp the dogs. I hope the government listens….